Explore the Underwater World of Mermaids Millions & Play Top Casino Games Online for Real Money – £37,500 Jackpot! 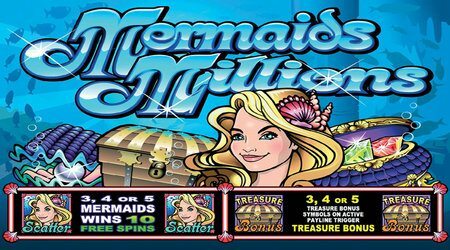 Join the underwater adventure of Mermaids Millions that is sure to impress any purists with its no-frill simplistic approach to online slots, with mermaids, seahorses, and other underwater creatures brightening up the experience at Luck’s Casino. This online slot sensation is rated as one of the top casino game for lots of different reasons: Simplicity and ease of play, instant jackpot wins, and most importantly, real money slots that players can enjoy from just 0.01p per spin! 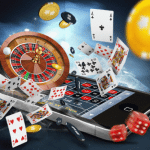 This 5 reel 15 payline slot game features regularly as one of the top casino game downloads on various app stores, showing how its popularity has held steady over the years. Mermaids Millions from Luck’s Casino works effortlessly on iPhone, iPad and other tablet devices, as well as Android and most other smartphone devices. The Best Online Slots Always Have the Best Bonuses! Mermaids Millions has managed to be a firm favourite of both novice and experienced slot players with its low (0.01p) to high (£375) betting range at the Luck’s Casino. This game has the charm of being a mid to low volatile online slot, giving it a stronger push in maintaining its place as one of the top casino games in the Microgaming site. Scatter Symbols: The Treasure Chest and the Mermaid are scatters. 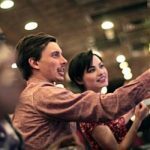 With a high maximum jackpot of 7,500 coins to be paid out, as well as loads of ways to trigger free spins and real money bonus rounds, there’s not much a player could want. It’s no wonder then that this game features as one of the choicest top slot games – both for those who have been fans for years, as well as newbies just starting out. As one of the top casino games, Mermaids Millions enjoys a return rate of 96-97%, with the wins decent enough to heighten your gambling experience but never worry about your bankroll. 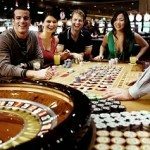 So go ahead and enjoy the UK’s top casino games at Luck’s Casino to try this bright, low on volatility, high on bets, online slot game that is sure to brighten up your day one spin at a time.